Shushuwafflez Creative Studio's designer, Su, is a Canadian costumer with passionate skill for her work; which can best described as elaborate and inspiring. She has been fashioning cosplays for over 8 years with careful attention to detail, and focus on projects that allow her to expand her growing repertoire of abilities. Su's work has won many awards since she started competing in 2011, including Best in Show: Craftmanship in 2012 at Anime North in Toronto and Best in Show at Otakuthon in Montreal. 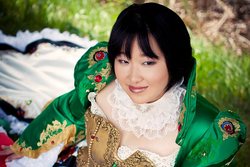 She is best known for tackling intricate costumes, such as Queen Esther and Calamity Jane of Trinity Blood, which allow her to show case her specialties of beading, embroidery and expert tailoring. All of which come together to create the perfect ornate finished piece. When Su is not working on her next costume, you will find her putting together tutorials and helping other cosplayers pursue their creativity and expand their knowledge. She offers sewing focused panels at various conventions, and has also acts as a judge for countless events. Su currently volunteers as the Masquerade Coordinator for Atlantic Canada's largest anime convention, Animaritime.